A man A plan A canal brings you another exclusive screening opportunity withExit Through The Gift Shop. Celebrated graffiti artist Banksy gives us a first hand look at the world of street art through the lens of an eccentric shopkeeper-turned-filmmaker who attempts to capture many of the world’s most infamous vandals on camera. It’s when the camcorder is turned back on its owner, however, that we experience the wildly unexpected results of what happens when fame, money, art, and vandalism collide. 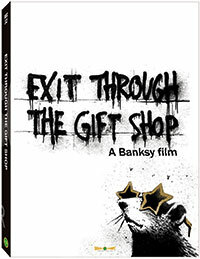 Exit Through The Gift Shop is available for screening starting December 14th. Since debuting at the Sundance Film Festival, the film has become one of 2010’s Best Reviewed films, being hailed as “exhilarating” and “provocative” by critics worldwide. Contact us today to set up your screening of Exit Through The Gift Shop!